Normally one of the most polarizing releases each year, 2017 Topps Triple Threads Baseball is not for everyone but the TTT set once again stays close to its roots. This obviously means lots of relics, die-cut slogans and foil-filled designs. Offering a pair of packs, every master hobby box features two autographs and two relics. 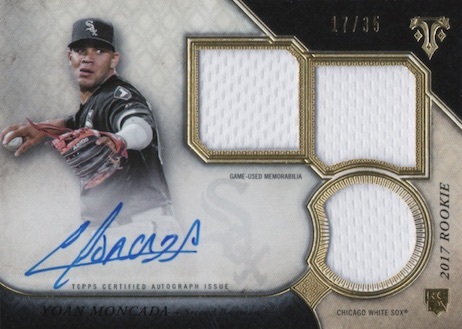 Case hits include a one-of-one autograph relic and a triple autograph triple relic. 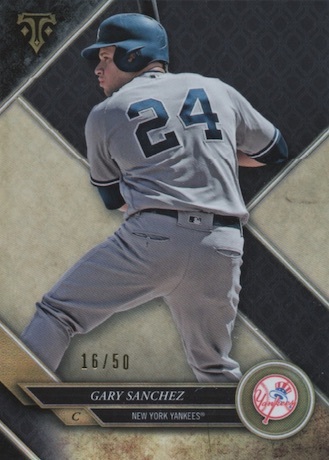 Utilizing a sectioned-off background design, the premium base set is amplified with many numbered parallels. They include Amethyst (#'d), Emerald (#'d), Amber (#'d), Gold (#/99), Onyx (#/50), Sapphire (#/25), Ruby (1/1), Printing Plates (1/1). Also part of the main 2017 Topps Triple Threads Baseball set, the Base Rookies and Future Phenoms Autograph Relic (#/99) cards focus on the budding stars. These are numbered to only 99 copies, but also add Silver (#/75), Emerald (#/50), Onyx (#/35), Ruby (1/1), Wood (1/1), and "White Whale" Printing Plates (1/1) versions. 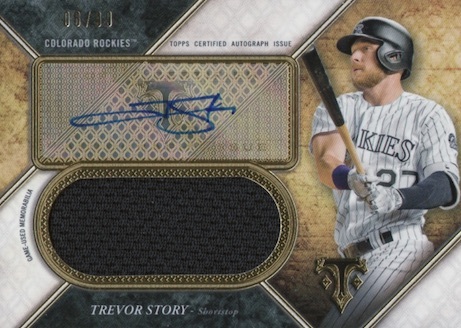 TTT doesn't stop there, as the 2017 Topps Triple Threads Baseball checklist is filled with many other signed cards. Taking another look at the first-year players, sans relic, the numbered Rookie Autograph set features the base design. These also have Emerald (#/50), Gold (#/25), Sapphire (#/10), Ruby (1/1) and "White Whale" Printing Plate (1/1) parallels. 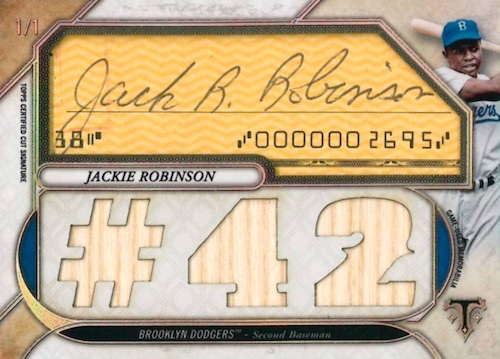 Tying in the "threads" part of the name, the Autograph Relics (#/18) insert applies the infamous die-cut jersey text with a signature. Autograph Relic Combo (#/36) cards bring that total up to three signatures and three relics. In Triple Threads style, both of these signed sets also come in several low-numbered parallels. 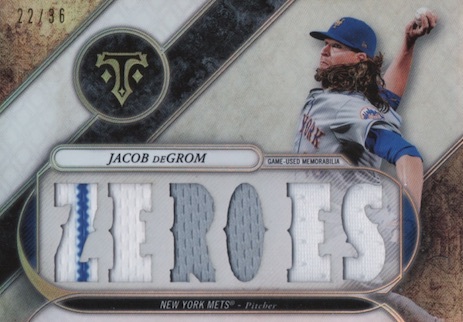 Of course, Triple Threads is known for having plenty of rarity and it delivers here, as well. 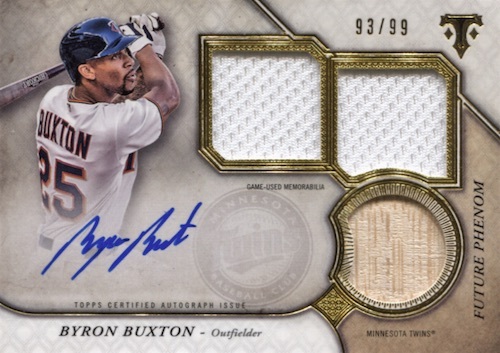 Jumbo Plus Autograph Relic Book (#/3) cards feature two patches and a jumbo patch, and Letter Plus Autograph Relic Book (#/3) cards go with a nameplate letter patch in addition to the two patches. Ratcheting way up in the memorabilia department, Autograph Deca Relic Book (#/10) cards bring 10 swatches for one player, while Autograph Deca Relic Combo Book (#/10) cards work with one relic for 10 players. Each of these has a Ruby (1/1) parallel and the signed Deca inserts also feature a Gold (#/5) edition. Another familiar line, Unity Autograph Jumbo Relics comes in a base version, numbered to 99 copies, along with Silver (#/75), Emerald (#/50), Gold (#/25), Sapphire (#/10), and Ruby (1/1) cards. 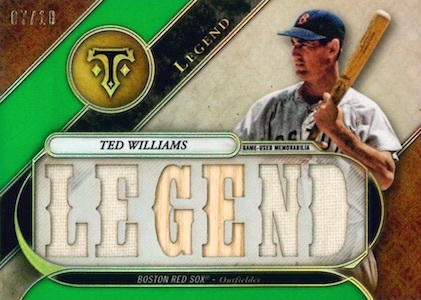 Giving the legends their due respect, Cut Above Relic and Dual Cut Above Relic both contain a one-of-one cut signature. 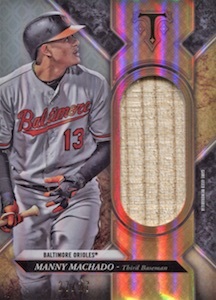 As a huge basis of the product, 2017 Topps Triple Threads Baseball memorabilia cards take many forms. Each numbered to 36 copies, they include Relics, Legend Relics, World Baseball Classic Relics, Relic Combo and WBC Relic Combo. Parallels build on that with Silver (#/27), Emerald (#/18), Gold (#/9), Sapphire (#/3), and Ruby (1/1) cards for each. 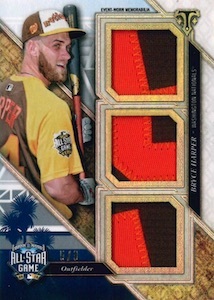 There are also All-Star Patches (#/9) with a Ruby (1/1) parallel. Requiring more card area to properly highlight larger memorabilia pieces is the large mix of booklet cards. Among the choices are one-of-one All-Star Jumbo Patch, All-Star Jumbo Sleeve Team Patch, All-Star Laundry Tag, All-Star Majestic Logo Patch and Jumbo Letter/Number Logo book cards. More booklet options include Bat Nameplates (1/1), Bat Knob (1/1), Jumbo Plus Relic (#/3), Letter Plus Relic (#/3), and Jumbo Patch Combo (1/1). The Deca Relic Combo Book (#/10) cards feature 10 players and offer Gold (#/5) and Ruby (1/1) parallels. And, finally, we have the Unity Jumbo Relics, limited to 36 copies, plus Silver (#/27), Emerald (#/18), Gold (#/9), Sapphire (#/3), and Ruby (1/1) parallels. 2017 Triple Threads Tyler Glasnow auto relic #’d to 50 Rays! See available 2017 Triple Threads autographs and relics on eBay. 100 cards. Shop base cards on eBay. PARALLEL CARDS: Amethyst #/340, Emerald #/250, Amber #/150, Gold #/99, Onyx #/50, Sapphire #/25, Ruby 1/1, Printing Plates 1/1. 41 cards. Serial numbered #/99. Shop on eBay. PARALLEL CARDS: Silver #/75, Emerald #/50, Onyx #/35, Ruby 1/1, Wood 1/1, White Whale Printing Plates 1/1. 20 cards. Serial numbered. Shop on eBay. PARALLEL CARDS: Emerald #/50, Gold #/25, Sapphire #/10, Ruby 1/1, White Whale Printing Plates 1/1. 278 cards. Serial numbered #/18. Shop on eBay. PARALLEL CARDS: Gold #/9, Sapphire #/3, Ruby 1/1, Wood 1/1, White Whale Printing Plates 1/1. 20 cards. Serial numbered #/36. PARALLEL CARDS: Silver #/27, Emerald #/18, Gold #/9, Sapphire #/3, Ruby 1/1, Wood 1/1, White Whale Printing Plates 1/1. 60 cards. Serial numbered #/9. 60 cards. Serial numbered 1/1. 12 cards. Serial numbered 1/1. 5 cards. Serial numbered 1/1. PARALLEL CARDS: Gold #/10, Ruby 1/1. PARALLEL CARDS: Gold #/5, Ruby 1/1. 153 cards. Serial numbered #/36. PARALLEL CARDS: Silver #/27, Emerald #/18, Gold #/9, Sapphire #/3, Ruby 1/1. 20 cards. Serial numbered #/36. Shop on eBay. 39 cards. Serial numbered #/36. 251 cards. Serial numbered #/36. Shop on eBay. 74 cards. Serial numbered #/99. Shop on eBay. PARALLEL CARDS: Silver #/75, Emerald #/50, Gold #/25, Sapphire #/10, Ruby 1/1. 10 cards. Serial numbered #/36. 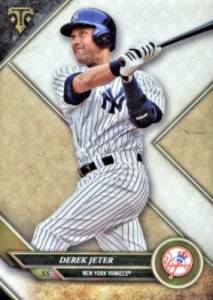 Good: Big-hit potential; quality relics; many low-numbered cards; attractive base design. Bad: Still too many sticker autographs; perceived rarity is manipulated by multiple versions and parallels; expensive box price for just two autographs and two relics. The Bottom Line: It’s TTT so there are no real surprises. Yes you are gambling at this price, and yes there are some amazing hits in play. Like many hit-based products, singles are the safer bet, but if you you can afford the chase, few sets in this price range offer the shot at such premium inserts. The darker main design of 2016 is followed by a return to the light. 2017 Topps Triple Threads Baseball base cards look great and these are some of my favorite base cards every year. A minor issue for me is the way they split the background into pieces and how that factors into the parallels. I find myself distracted by the awkward box that is filled with a rich color. Although there never seems to be quite enough signing room, the on-card Base Rookie and Phenom autograph relics are benefited by the lighter design color as the signatures really pop. Unfortunately, hard-signed cards are not the norm as most others use stickers. And, for many sets, we are talking about stickers placed over gaudy gold foil boxes. Most egregious is the use of stickers on the low-numbered booklets. None of this is new but it still holds the brand back to an extent. Sure, there are many other inserts to chase, but unless you are breaking a large amount of boxes, the variety is mainly going to be the same group of designs (i.e. Unity, die-cut relics and rookie autographs). 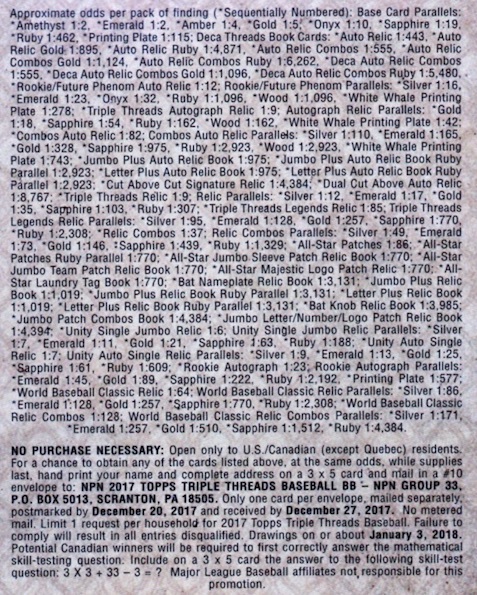 I don’t think the 2017 Topps Triple Threads Baseball checklist is misleading but it can be a little more difficult to fully process. Again, this is not specific to 2017. For instance, when most hits are numbered to 36 or less, sets that have base versions at 99 copies (Rookie and Unity Autographs) become quite common. That’s not a surprise but it should make it much more obvious which cards are likely to show up in a given box. On top of that, nearly every set in TTT outside of the rarest hits has 3-4 parallels that aren’t one-of-one editions. So that #/36 die-cut relic you pulled actually has over 90 copies. Another Triple Threads habit is to make multiple versions of the same (mostly lesser) player in one insert set. So many younger players have five different die-cut auto relics, while Buster Posey, Mike Trout and Clayton Kershaw each only have one. The other problem is that while the checklist appears massive, there really are only a few teams and players covered in any decent amount. Given all this, unless you can break by the case, 2017 Topps Triple Threads Baseball is much better for group breaks or for singles. Two autographs and two relics (plus some base) for around $180-200 at the time of this review. That’s a tough proposition. Can TTT deliver that value in box? Of course. Many cards have already sold on eBay for over $500 each and several in the four-figure range. The other side of that is many more signed cards sell for $1-10. So your basically counting on all four hits being worth $40+ each or pulling a case hit. Neither is likely. What you have to understand is that you are also paying for the chance at something big. 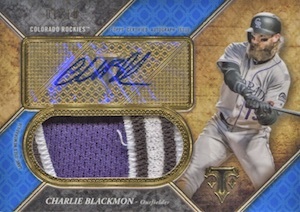 That’s why Triple Threads has always been a gamble even with the stronger rookie class this year led by Judge. While it is certainly not cheap, 2017 Topps Triple Threads is average-collector expensive versus the are-you-kidding-me expensive that Topps has pushed more into lately. I like that collectors looking for a splurge can still open a premium release without having to put down a mortgage payment for it. And it’s truly a beautiful set with a high-end feel. Stickers dampen that fun and the excitement can give way to extreme disappointment in quick succession. 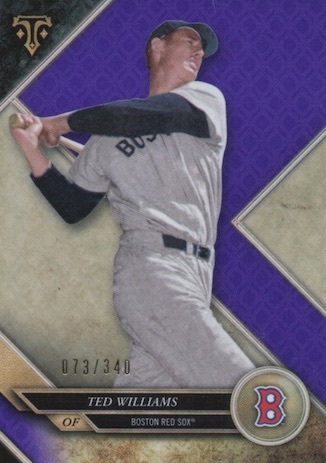 For me, two solid hits and the quality of the base cards made the box fairly enjoyable. On a side note, the QC process was better this time and all cards looked nearly pristine out of the box, which is nice. Corey Seager 1 1!! 2017 Topps Triple Threads Jumbo Book Card Letter Auto!!! Am I the only one who is jealous of the Marlins patch colors? Man, do those POP! Some of these cards look *PHENOMENAL*. The jumbo patch booklets are insane. Unfortunately, my guy is going to likely have several parallels of plain swatches or bats. Lmao. Just when I thought Gold Label was the most embarrassing thing Topps produced to date, at least as far as the Twins being represented, I read this checklist. Literally, the Twins have 1% of the Base card total. 1%. And then a few autos and relics drizzled in. I mean, in one subset, Floyd Mayweather, a BOXER is represented almost half as much as the Twins are! In a baseball card set, a FIGHTER, BOXER, whatever, has two cards in a subset where the twins have just 5, of the same player of course. No Legend relic cards, because we never had Killebrew, Carew, Puckett, Johan, how bout Oliva? Never ever represented in any Legends stuff. My bad, now I see Carew…the California Angels Carew. Where he spent half as many years as he did with the Twins. TOPPS has disappointed us all..
boosting the price point on this over all these years.. yes, by cost its a premium product for sure. instead its mostly lower calibre talent..
your $200 will get you $30 – $50 in cards — 8-9 times out of 10.. and even if you get the case hit – you are barely breaking even in most cases. Hope whoever reads this..if you decide to break some.. at least break even.. odds are against it. still walking funny after that.. This is my first time rating a product but I am a long time collector. 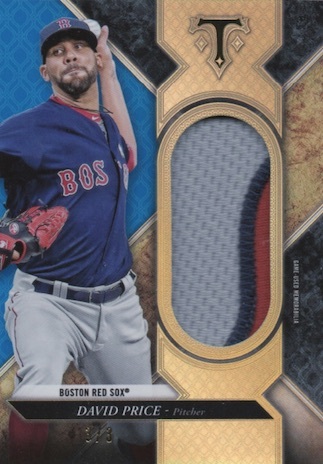 From what I saw opened today and what is on the secondary market I noticed a lot of lack luster jerseys not many nice patches even on cards numbered to 9. Very boring looking set for triple threads. Glad I didn’t preorder any boxes and feel bad for those who did and didn’t hit a big case hit. All Star patches are always very cool but so tough to hit. Bought 3 boxes today, so 6 minis. 2 minis had no autos. What a complete ripoff. I would have been a little received if the other hits were something great, but they were not, Greg bird auto, Urias redemption auto, and 2 other clowns. Did get all the relics I was supposed to, but all, yes all were a single color. Might get 40.00 back for the 600.00 I put out. I would give it 0 stars if I could, by far the worse product I have opened this year to date. 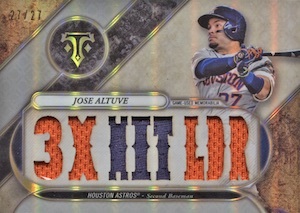 Always liked Triple Threads. Too many people expect too much from every box. View the checklist and then make your decision. I got 3 boxes and 5 of the 12 relics/auto relics were multi color. Bogaerts Jumbo patch ruby 1/1, Jeter, Arenado, multi color relic. Over the course of a year I buy and rip an average of 3 boxes a week. Sometimes I do good and sometimes not. I enjoy the rip. My hobby has paid for itself the past 4 years so I guess I’ve been lucky. The hype behind this product is consistent year-after-year but as an NFL fan and having barely watched baseball as a kid I’ve strayed away from purchasing any, well, until this year. Allow me to start off by saying that Topps does an excellent job at producing their cards from a quality standpoint. 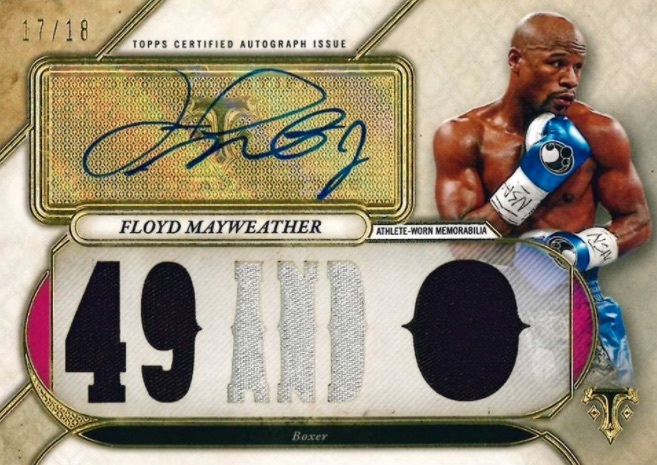 Not one card from an entire case of this product showed damaged edges, smudged autos, etc.. Truthfully, this is all we ask for in the hobby, unless your an investor looking for those big hits. The cards themselves depicted great photos of each player, with some awesome patches, great color schemes, and fantastic variations. This one product from Topps has made a dramatic impact on me, from a quality standpoint, which has resulted in my confusion on why I’ve purchased Panini products at all. I suppose I’ll be following baseball more from this point on until their return to the football card scene. I know it can be a crap shoot, that isn’t the issue per se, but at this price point it should warrant something decent per box. Maybe 50% of box cost at least. Got a Steven Matz auto, Sean Newcomb rookie redemption auto(really? ), Starling Marte jersey and a Kohsuke Tanaka WBC jersey card. Seriously, the best the back of the Tanaka card could say was that he appeared in 3 (3!) games during the WBC. That’s the last box of Triple Threads I will ever buy.